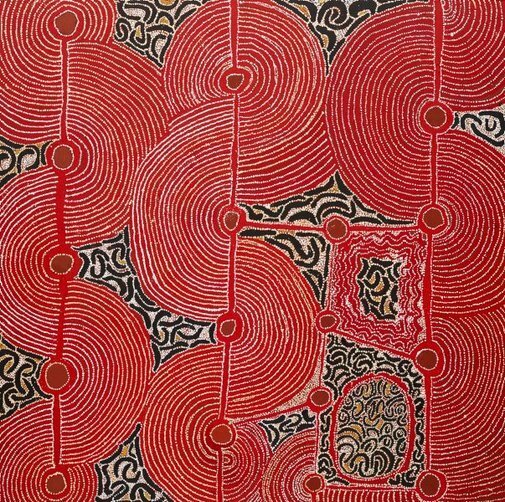 In recent years a number of art centres have been established throughout the Anangu Pitjantjatjara Yankunytjatjara (APY) Lands which stretch across the north of South Australia. In these communities, many with only basic facilities, the art centres provide a culturally appropriate way for people to achieve economic independence on their own country. The community of Amata, some 380 kms south of Mparntwe (Alice Springs), and its surrounding homelands are serviced by Tjala Arts. This Aboriginal-owned and managed corporation was established by the women of the community as Minymaku Arts (Ladies Arts) in 1997, but renamed in 2006 to reflect the increased involvement of men, such as senior artist Hector Burton. 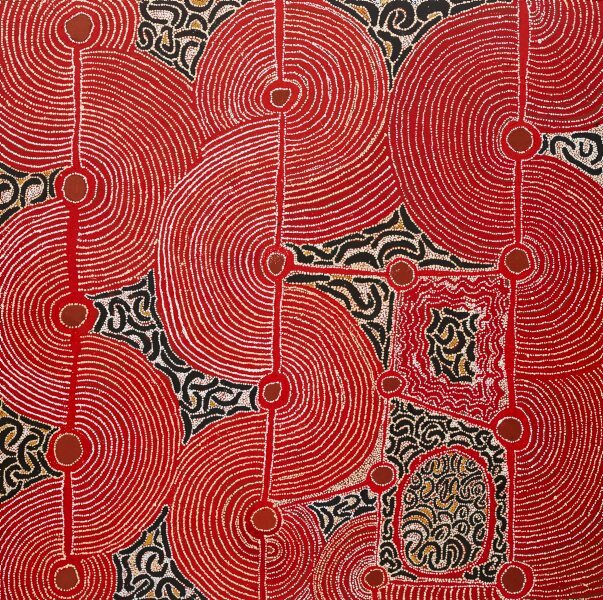 The art centre documentation for this works states: This painting tells the story of the caterpillars ' anumara'. The anumara is the large edible caterpillar with a hook on its tail. It is a story about kinship groups – represented by north and south. Hector is in one group – the south (anumara). His uncles, nephews and fathers are in the other – the north (muya muya and ngalyakanti – the other caterpillars). All the caterpillars travelled from places in the north and the south and all met up in one resting place (ngura). When the minima (women) and tjitji (children) arrive, the women dance in the fire and give the man the ceremonial stick. This is a beautiful ceremony which Hector went through, long ago. This ceremony was not performed for a long time, until more recently, when men from Amata took part.